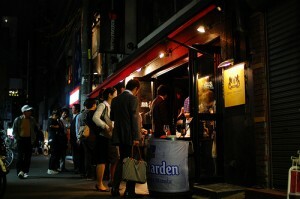 Tachinomi Izakaya is a Japanese style bar where customers drinking while standing. It is said that there are currently 1,000 of them in Tokyo. It is more than the total number of the major beef-bowl chain restaurants (Yoshinoya, Matsuya, and so on), which is 800. The inside of Tachinomi Izakaya is usually simple, there are only oil drums or piled up sake carriers as tables. Recently, there are some stores that put more attention to their interiors for female customers. Average amount from one customer is 2,000 yen (about 22 US dollars), which is much more inexpensive than regular izakaya. Tachinomi Izakaya gives advantages not only to the customers, but also to the proprietors. It doesn’t need much initial cost, compare to that of regular izakaya. To open a regular izakaya, it costs about 50 million yen (56,000 US dollars), but Tachinomi costs only 5 million yen (560,000 US dollars). According to a survey, 60% of salary men think that they need some occasions to go drinking with the whole people in their offices. 70% of them answered “drinking party with co-workers is fun”. Tachinomi Izakaya is a perfect place to ice break with co-workers. Do you have custom to go for a drink with your co-workers in your country?